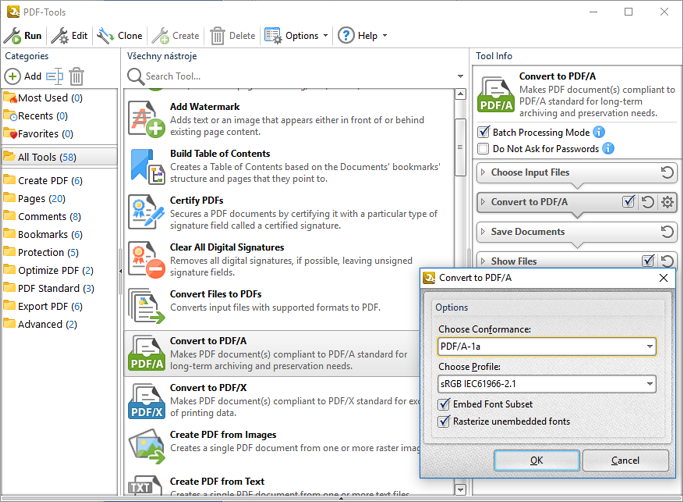 CAD Forum - How to save PDF/A-1a archive from CAD software AutoCAD, Inventor, Revit? CAD applications usually contain internal functions for publishing drawing documentation to PDF format files. Additional PDF tools like Adobe Acrobat then add to this by supporting not only the standard PDF publishing format but also its archive version PDF/A, specifically PDF/A-1b. But sometimes you may need to deliver or archive your technical documentation also in other variants of the PDF format, e.g. PDF/A-1a (incl. doc structure), PDF/A-2a, PDF/X and others. PDF-XChange offers a multi-lingual user interface so it is available also in English and German. Tip 10903: How to import an Illustrator file (.AI) into AutoCAD (.DWG)? Tip 10514: PDF published from AutoCAD 2016 has rectangles displayed around texts. Tip 7828: How to plot PDFs without the tab (layout) name. Tip 6467: How to disable the pop preview when printing from AutoCAD to PDF? Tip 6224: Saving a drawing to the archivation format PDF/A-1b. Selected tip: AutoCAD displays a warning "About to regen -- proceed?". How to get rid of it? Supported file types (applications) with reference detection in Autodesk Desktop Connector. « | » How to find net surface area (sans holes) of an unfolded sheetmetal part in Fusion 360?